In the battle for the best kids' tablet this Christmas, Archos offer a great value Android 4.0 tablet, the Arnova ChildPad. Only 12mm thick and weighing just 380grams, this is a kid-friendly tablet that packs a lot into a small space. With a 7'" screen, child-friendly colourful interface with easy to navigate folders, and a lightweight format, the Child Pad comes preloaded with games, entertainment, learning and puzzles. However, Archos knows what kids love most, so it comes preloaded with 28 of the most popular app games on the planet, including Pig Rush, Flight Fancy and the superb Angry Birds. If you get fed up with the "heenahs!" of catapulted pigs, kids can plug in headphones and play to their heart's content, Kids can also listen to their favourite tracks while you have a post-turkey snooze through the headphones, or keep you awake using the integrated speakers. Kids can enjoy more than just games, as the Android system gives them access to thousands of apps via the AppsLib online store, (OK, and the ability to play online games thanks to built-in Flash 11 support). Video chat is quick and easy thanks to the built-in camera and the generous wide screen format. As a parent, you can control exactly what your kids view and access via the the built-in Wi-fi, as the browsing controls are powered by leading Mobile Parental Filter providers Editions Profil. The Intelligent Content Evaluation system checks websites sites as your kids browse, blocking inappropriate content and keeping the web experience safe for your kids. The ChildPad is the only kids tablet to have such advanced parental control. 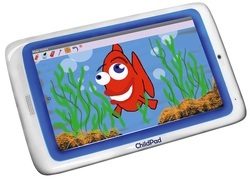 While the ChildPad isn't perhaps the most elegant of the kids tablets available this Christmas, it's got one major advantage over the others - the price. For the best price on the Archos Child Pad, see our price comparison box at the top of this page. It's updated daily, so you'll always see the cheapest price!